To say that the recent lawsuit filed by the lesbian couple Jennifer Cramblett and Amanda Zinkon has caused a stir would be an understatement. Desiring children, Cramblett was inseminated at Midwest Sperm Bank in Downers Grove, Illinois. The issue arose when, into Cramblett's second trimester, the couple contacted the same clinic to secure another donation from the same donor for a second child, a biological sibling of the first. The couple was then informed that Cramblett's egg had been inseminated not with the desired sperm of the white, blonde-haired, blue-eyed donor #380, but with that of the black male (presumably brown-haired, brown- eyed) donor #330, the result of a clerical error (a hand writing mishap to be exact). Did I mention that Cramblett and Zinkon are both white? Where the outrage has ensued is with the couple's $50,000 wrongful birth lawsuit against the clinic. The word "wrongful" implies that something unjust, unfair or unlawful has transpired and as such has provoked anxiety around the implication that this biracial child is somehow being named as a broken or flawed "product." While Cramblett has stressed that she and her partner love their biracial daughter, the little girl's racial distance from her mothers' reproductive desires (measured in the blackness she has inherited from her father) serves to highlight the distance between blacks and whites in America and in other western nations with shared colonial histories. In the lawsuit, the couple frames the search for damages as a way to facilitate their move out of a homogenously white neighbourhood for their daughter's "psychological well-being," also citing their family's unconscious insensitivity to race and the need for ongoing counselling. While it is true that black children require strong role models, and family and community support to survive and thrive in a racist society, it is unclear why the homogeneously white Uniontown which they deemed to be wildly inappropriate for their biracial daughter would somehow have been perfectly fine to raise the sought after white child, the product of their egg and the white blonde-haired blue-eyed donor #380. Is this not the question? Why is racially segregated living perfectly fine for whites in the absence of an intimate connection to a person of colour? The lawsuit implies that had the couple received their white dream baby, they would not have thought to move their family from Uniontown or to reform the "unconsciously insensitive" racial behaviour of their family. While Cramblett takes pains to state that she has never had racist encounters in Uniontown, the fact is that homogeneously white spaces often produce antagonisms and racial hatred towards people of colour, who remain unknown and seemingly unknowable except as characters on TV. Cramblett is actually right to be concerned about her daughter's welfare in this racially homogenous space. But what is more difficult is her alleged statement about her own fears of travelling to a black neighbourhood to get her daughter's hair done. Since I have seen far too many white adoptive parents of black children with unkempt hair, I do not have a problem with Cramblett and Zinkon seeking the aid of black hair dressers in black salons to properly care for their daughter's hair and to eventually instruct the little girl in the love and care of her biracial body. However, as the mother of what American society will see as a black child, Cramblett's cross-racial discomfort makes me uncomfortable and fearful about the ways that her own "unconsciously insensitive" feelings about race will impact her interactions with her daughter. The choice of insemination is a difficult one for anyone whether as an individual or a part of a couple. However, for homosexual couples, given that they are biologically unable to reproduce within their unit, egg or sperm donation is arguably more of an urgent matter. 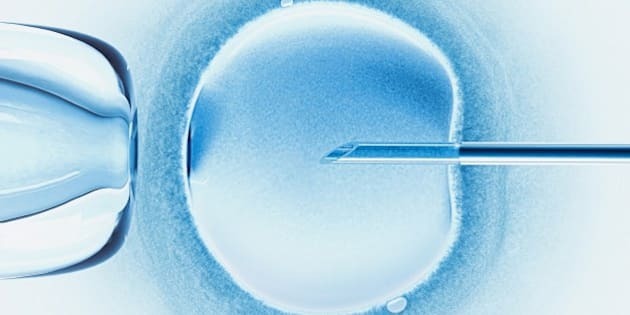 That said there are countless heterosexual couples that have experienced infertility issues, which have caused them to require the aid of a donor or to go through the process of in vitro fertilization through which one is at the mercy of the protocols and practices of a fertility clinic. As such, I believe that any person capable of empathy can understand Cramblett and Zinkon's initial anxiety about being given the wrong sperm. What makes people uncomfortable is the extent to which the race of the unexpected black donor's sperm was the provocation of Cramblett's reaction of "anger, disappointment, and fear." For a lesbian couple, unless the donor is a relative of one of the partners, there is currently no possibility of a biologically shared child. And yet, the selection process of sperm banks function through the idea that this biological ideal can be achieved, hence the quest not just for desired racial type, and skin tone, but even eye and hair colour. But where does the idea of biological resemblance meet racial identity. The big question is, since the sperm of donors #330 and #380 both represented non-familial contributions, why is it that we believe that the resulting child would have looked more like Cramblett if the father had been white, rather than black? Does resemblance only function at the level of dominant racial markers like skin colour and hair texture? Or is that merely the way in which we have been taught to identify ourselves in other people and therefore to identify with other people. There are countless parents who have adopted children from their same racial groups and many more who have adopted children of other races. In all cases, these families must reconcile issues of resemblance with familial belonging. The extraordinary mixed race heritage of some black populations (for instance many Caribbeans and South Americans) means that it is quite normal that even within heterosexual unions with two so-called black partners, you really do not know what your child will look like "racially." In my family, which includes people of African, Asian, and European ancestry, that is certainly the case. Perhaps the lesson in the case of this painful mix up is that what is initially perceived as a "mistake" is not always so. Cramblett and Zinkon have been forced to reconcile their white personal, familial, and community racial biases and privileges in order to be the best possible parents to their precious biracial daughter who is the complete opposite of flawed.